STARTING in the October 1933 issue of Sky Fighters and running almost 5 years, Terry Gilkison’s “Famous Sky Fighters” was a staple of the magazine. 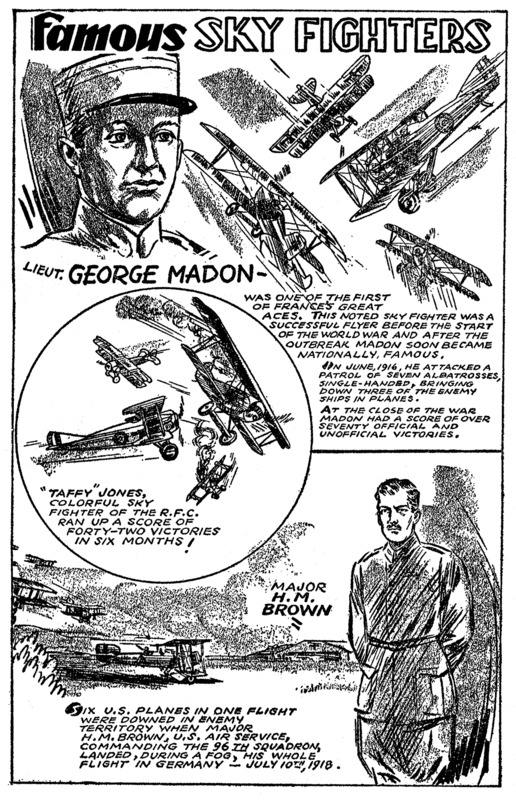 Each month Gilkison would illustrate in a two page spread different Aces that rose to fame during the Great War. Although Gilkison was probably better known for his syndicated newspaper work, he also provided black and white story interior illustrations for pulp magazines. His work appeared in Clues, Thrilling Adventures, Texas Rangers, Thrilling Mystery, Thrilling Western, and Popular Western. Gilkison provided similar features in a few other Thrilling Publications—there was “Famous Soldiers of Fortune” and later “Adventure Thrills” in Thrilling Adventures, Famous Crimes” in Thrilling Detective, and the fully illustrated air adventure stories of Buck Barton “The Flying Devil” in The Lone Eagle! He signed most of this work with only his initials “T.G.” to maintain a low profile and preserve his reputation as a syndicated newspaper cartoon artist. 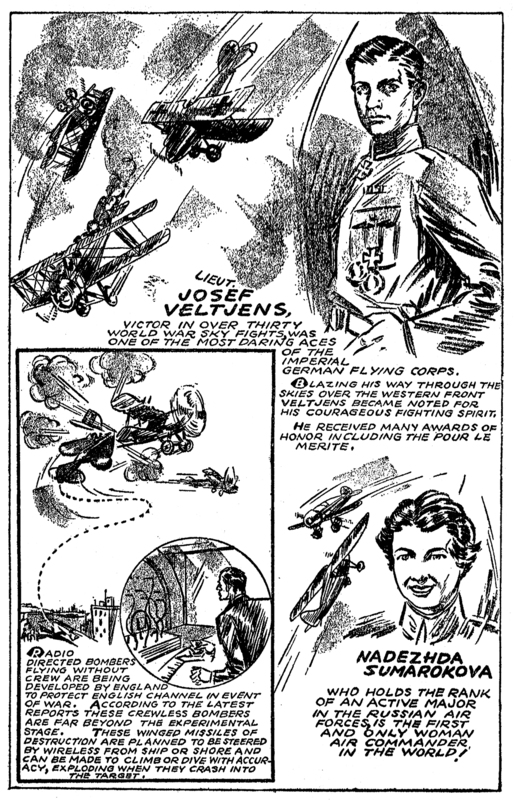 The May 1935 installment, from the pages of Sky Fighters, Features Lt. Georges Madon, Major H.M. Brown, Lt Josef Veltjens, and the world’s first air commander—Nadezhda Sumarokova! Next time in “Famous Sky Fighters,” Terry Gilkison features Julius Buckler, Capt. Francis Quigley, Lt. Sumner Sewall, and Commander Herbert Wiley! Don’t miss it!